The Island Suites is located on St. George Island on the beach front within walking distance to the majority of restaurants and shops. 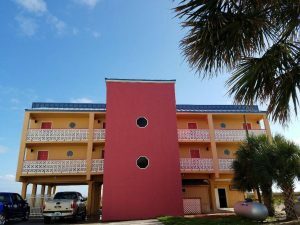 8 separate suites each having a private balcony overlooking the beautiful Gulf of Mexico, 1 king or 2 queen beds, refrigerator, microwave, in-room coffee, guest room amenities, cable and internet. There are 2 handicap accessible rooms either with 2 queen beds or 1 king.